Artists are Neal Brown, Jake Clark, Ricardo Cinalli, Siobhan Collett, Emma Douglas, Julie Goldsmith, Josephine King, Sam McEwan, David Medalla, Malcolm McLaren, James Moores, Benedict Pulsford, Marc Quinn, Will Self, Heathcote Williams, Emily Young and Caroline Younger. First presented by Brown and the author Will Self in 1995, the project is now complete, and works are for sale. Neal and the artists have very kindly chosen to support Action on Addiction through the sale of these paintings. I began curating Consequences in 1993 – it was a different time, in terms of painting, and seemed like a good idea . . . The paintings are based on the non-competitive chance drawing game Consequences, a game invented by the Surrealists, based on an old parlour game. The game is also known as ‘Exquisite Corpses.’ A figure is drawn in three sections: one person draws a head, and a second and third person each draws a torso and legs respectively. At no point during the making of the drawing does anyone see the contribution of his or her predecessor until all the sections are completed. For this exhibition the game is played by invited artists, faithfully following the rules, but working in paint on canvas on a large scale, 96 x 48 inches (243 x 121 cm). In the context of issues around drug and alcohol abuse, there could be a punning relationship between the title, Consequences, and the consequences of drink and drugs addiction. There are a lot of consequences of drink and drug addiction, of course. (There could also be some kind of punning relationship with the name ‘Exquisite Corpses’, but I think this might be taking dark humour a little too far for comfort.) The subject of drink and drugs was not imposed on the artists, and they had complete freedom to do whatever they wanted. Which they did, fantastically. In 1995 Will Self and I presented a charity fundraising event entitled Atoxia 95, which included a showing of Consequences. Action on Addiction (it was called the Addictive Diseases Trust, then) was one of the beneficiaries. Money was raised by admission charge, meaning that this is the first time the works have ever been available for sale. This is with the exception of one painting by James Moores, Marc Quinn and Malcolm McLaren. This painting was donated to a charity fund raising auction of contemporary art for Action on Addiction, in 2001. David Bowie was on the committee, and Sotheby’s conducted the sale. It’s now 2017, an embarrassingly long time since the series was commenced. 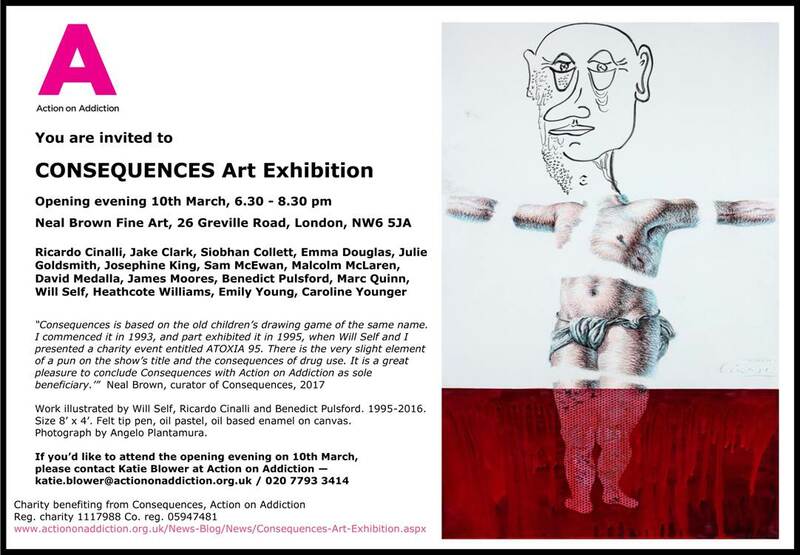 But I’m happy to be able to say that the Consequences artists remain very happy to offer their continued support to Action on Addiction and its excellent work by allowing the paintings to be exhibited and, finally, sold. This entry was posted on 2 March, 2017 in homepage and tagged Benedict Pulsford, Caroline Younger, David Bowie, David Medalla, drink and drugs addiction, Emily Young, Emma Douglas, Heathcote Williams, Jake Clark, James Moores, Josephine King, Julie Goldsmith, Malcolm McLaren, Marc Quinn, Neal Brown, Ricardo Cinalli, Sam McEwan, Siobhan Collett, Sothebys, Will Self. Bookmark the permalink.